New Horizons’ fourth annual checkout is nearing its mid-point, and continues with a workout for the spacecraft systems, cameras and other instruments that will deliver the first data from Pluto and its moons. Preparations for a small but necessary course-correction maneuver are also on track. Since “ACO-4” began on May 25, mission operators have uploaded new software for New Horizons’ on-board autonomy system, and checked out most of the spacecraft’s backup systems, including guidance and control, communications, command and data handling, thermal control, power and propulsion. All of these backup systems have performed well. 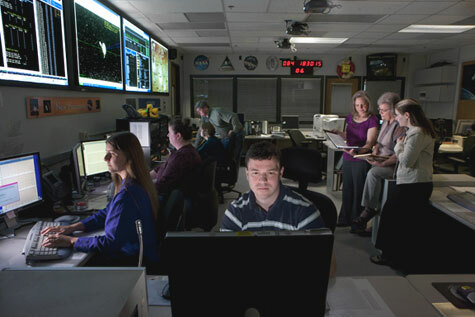 On June 21 the project starts an eight-day “encounter-mode test,” in which key spacecraft and ground components will be configured to run as they will during the Pluto flyby, five years from next month. This gives mission controllers a chance to make sure New Horizons will, among other operations, steady itself, point the science instruments in the right directions and correctly send data back to Earth. It also ensures that the systems on the ground, needed to send commands to and acquire data sent from the spacecraft, are correctly configured for encounter dress rehearsals in 2012 and 2013. Surrounding and even during the encounter-mode test, New Horizons’ science instruments will undertake a comprehensive list of data-collection and calibration activities that includes long-distance imaging of Jupiter, Uranus and Neptune, as well as observations of the charged subatomic particles – “space plasma” – near the orbit of Uranus. NASA’s Deep Space Network antennas are collecting tracking data that the Navigation team from KinetX, Inc., is using to pinpoint New Horizons’ location and predict where it’s headed. Based on this prediction, the navigators are collaborating with the Mission Design and Guidance and Control teams from APL to design a trajectory correction maneuver, or “TCM,” for June 30 that will slightly adjust the spacecraft’s velocity and put New Horizons on course to Pluto. So far they estimate that this TCM – only the fourth course correction since New Horizons launched on January 19, 2006, and the first since September 25, 2007 – will last only about 35 seconds and change the spacecraft’s speed by about one mile per hour. But with five years of travel time to go, those miles would add up, so the maneuver is needed to keep the spacecraft on the precise track to reach the “aim point” for the Pluto encounter on July 14, 2015. ACO-4 runs through July 30. Follow the latest on the annual checkout activities on this site as well as Twitter and Facebook.